Do I need to run the Malicious Software Removal tool? - Ask Leo! I have a Fujitsu laptop running Windows 7 with Service Pack 1. It’s running fine. I used Microsoft Security Essentials per your recommendation. After reading your last newsletter about manual updates, I went searching around the MS download site and found out about the Microsoft Malicious Software Removal tool and Microsoft Security Scanner. Should I download both of these and run them? Or are they earlier versions of software that are now wrapped up in Microsoft Security Essentials? I wouldn’t necessarily consider them wrapped up with the existing software. But you don’t have to worry about them. Let me explain. 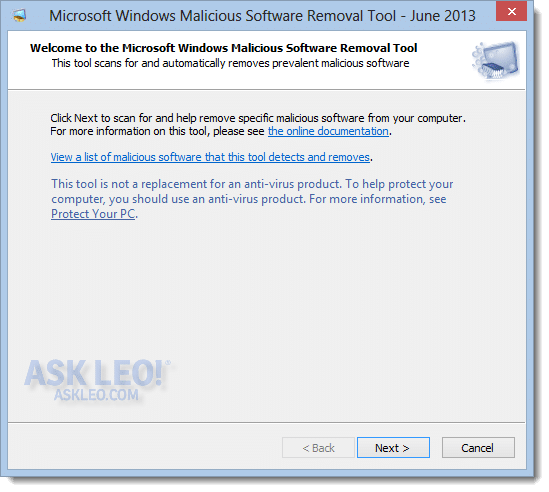 What is the Malicious Software Removal tool? The Malicious Software Removal tool compliments anti-malware tools like Microsoft Security Essentials. It takes a different approach than your normal anti-malware tools as it looks for software that’s known to be malicious and removes it. I don’t know exactly how it does what it does, but I do know that it’s downloaded automatically if you turned on Windows Update. It essentially runs for everybody, typically once a month, regardless of which anti-malware tools they use. It’s designed to provide a base level of protection in the operating system without you necessarily having anything else installed. You’ll note, however that the tool itself is careful to point out that it is not a replacement for ananti-virus product. 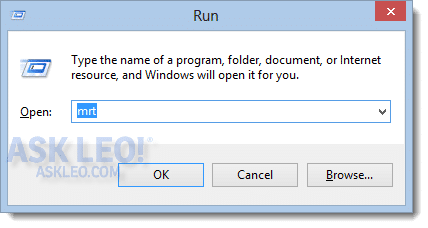 Downloading the Malicious Software Removal tool is really something you need not worry about, perhaps unless you are actively tracking down some kind of malware problem, and then only to make sure you have the latest version. Normally I wouldn’t spend any time running it manually. It all gets handled transparently for you in the background by Windows Update. « Previous post: Does a wireless range extender compromise my security? My computer does a file dump and promptly switches off whenever the MSR tool runs automatically during a Wndows update. I tend to install anti-malware tools as early in the process as is practical, just in case. hi on my windows 7, a pop up is wanting me to load this program- is this a virus or? If it pops up when you are browsing the Internet, it’s most likely a pop-up ad. This is normal and you can simply close it and ignore it. If it pops up when your browser is closed, that’s usually sign of malware. ok because it comes up that it wants to run every time I open my computer- is there a fix to that so that I don’t see it. If that’s a message from Windows, you’ll have to decide whether or not it’s a program you want to have start with Windows. Then, click yes or no. Normally that should stop it from popping up again. If not, what program is it asking to start and what is the exact message you are getting.